Super Eagles forward Sylvester Igbonu has signed a two-year contract extension with Russian Premier League side FC Ufa. Igbonu has been with the Russian outfit since July 2015 and the latest contract extension is expected to keep him at the club till 2020. FC Ufa announced the contract extension on their official website with a statement revealing the details of the deal. 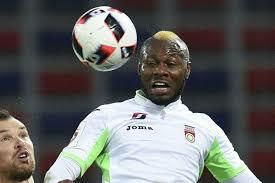 The statement read, “Football club Ufa and Nigerian striker Sylvester Igbun extended the contract. The term of the new labor agreement is calculated for 2 years. The 27-year-old made his debut for the Super Eagles in an African Cup of Nations qualification (AFCON) encounter against Tanzania on September 5, 2015, when he replaced Moses Simon. Igbonu celebrated his contract extension as he posted a message on his official Instagram account which said, "Happy to sign a new contract with my team FC Ufa,thank you, Jesus, and thank UFA football club for believing in me, promise to always give my all"
He joined FC Ufa from Danish side FC Midtjylland, and previously played for grass root outfit club FC Ebedei. He has made a total of six appearances for the Super Eagles, his last in the 2018 FIFA World Cup qualifiers against Swaziland in the preliminary rounds.